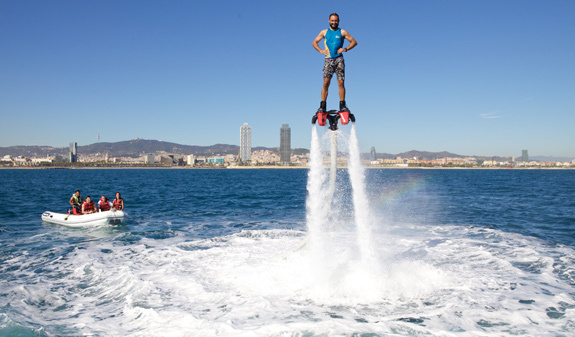 The most fun and exhilarating way to explore Barcelona’s coastline. 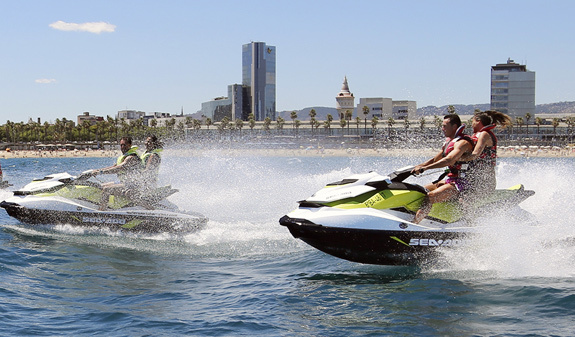 Enjoy unique views of the Barcelona skyline as you navigate the coast on these guided jet ski tours. Cooling and thrilling! In summer, you can combat the heat in the shade of a palm tree, but the beaches of Barcelona offer you water sports that are exciting and cooling at the same time. 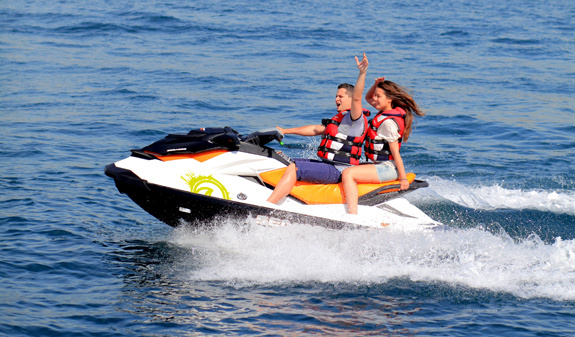 If you want to have fun on the sea, hop on board a Jet Ski, a motorised watercraft that guarantees a thrilling ride. 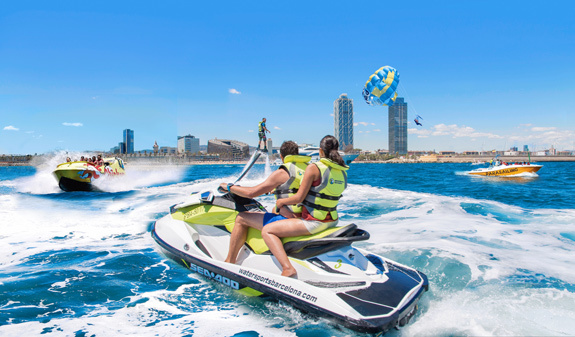 Zoom through the Mediterranean at the helm of a motorised watercraft, past Barcelona’s beaches. Driving a Jet Ski is really easy. The instructor will give you the necessary safety briefing and be on hand to deal with any questions or problems you may have. You don’t need any qualifications to hire a Jet Ski, so you can book straightaway. Let yourself be carried away by the matchless views of the horizon and live an adrenaline-fuelled adventure. 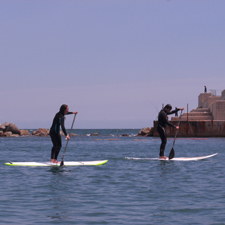 An excellent way to sightsee, do sport and enjoy the sea to the full!. Guided tour with an officially qualified instructor. Safety briefing so you can operate your Jet Ski safely and competently. Jet Ski hire according to the chosen length of tour: 30 minutes or 1 hour. 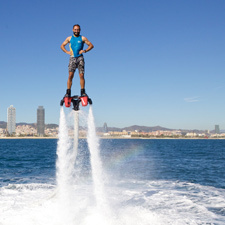 JetSki 15 minuts + Flyboard 15 minuts. 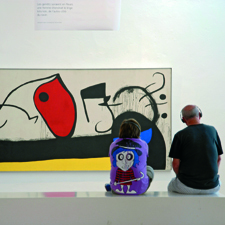 Times: April to October: daily, 10am to 8pm. November to March: daily, 11am to 5pm. Length of tour: 30 minutes or 60 minutes. Meeting place: Port Olímpic, moll de Marina marquee, on the corner with the Moll de Mestral. Port Olímpic. Metro: L4, stop Ciutadella-Vila Olímpica. Bus: 36, 41, 45, 59, 71 and 92. 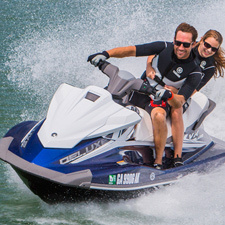 The Jet Skis have a man-overboard device that will be connected to the driver’s life jacket. The Jet Skis are equipped with the most advanced security systems. A 100€ for each JetSki deposit is required before departure. This will be refunded at the end of the trip.